Are You a “SNACKTIVIST”? You SHOULD be. 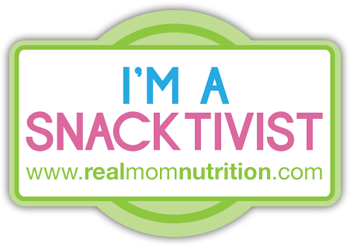 My fellow family health advocates, Susan Hayden and Patrick Fellows recently turned me on to the fantastic concept of “Snacktivism” through the blog Real Mom Nutrition by Sally Kuzemchak, MS, RD. Click through to find out exactly what “Snacktivism” is and for some great snack ideas to help you be the “Snacktivist” your kids need you to be. Snacking on junk food has become the norm—and suddenly, kids can’t do anything without being served a snack. Packaged cookies and gummy fruit snacks are doled out any time kids gather in a group, from a two-hour preschool class to a 45-minute pee-wee soccer game. Every sporting event is now a reason to celebrate with cookies. Children are given juice boxes, pouches, and bottled punch instead of water. Snacktivism is a grassroots effort to stop this for the sake of our kids’ health. Not only because rates of childhood overweight and obesity are alarmingly high, but also because we owe it to our children to equip them with healthy eating habits. If we teach them that a snack is an artificially-colored cookie out of a package, how do they ever stand a chance at maintaining a healthy weight, avoiding complications like diabetes and high blood pressure, and living a long, healthy life? Snacktivism is about finding a better way. It’s about thinking twice before serving snacks, about considering whether kids actually need a snack. And if they do, it’s about making a better choice. It’s about offering whole foods and about making fruits and vegetables a default choice. Snacktivism is not about giving up cookies and cupcakes. Instead, it’s about putting them back in their place as special occasion foods, not every day choices. I couldn’t have said it better! My favorite post so far has to be Soccer Mom Soapbox which reminds us to be mindful of not letting snacks sabotage all the physical activity we go out of our way to ensure our kids are getting. Need some help choosing snacks? Download the Girls on the Run Healthy Snacks Flyer that I created for the Girls on the Run of South Louisiana. It’s filled with tasty and nutritious snack ideas and even a couple of recipes. Thanks so much for linking to my blog and for promoting Snacktivism!